The highest standard for filtration, HEPA filters capture 99.99% of all particulate matter down to .3 microns. HEPA filters (High-Efficiency Particulate Air) have quickly become the new standard for wood dust collection, both in the workshop and on the jobsite. Measured in microns, wood dust is particularly troublesome to remove from an environment once it is airborne. The best way to minimize the effects of dust created during fabrication is to use tools that are designed with dust extraction in mind. When partnered with a good dust extractor with proper filtration, you will be able to eliminate the majority of the dust created at the source before it is ever released into your environment. Designed to trap particles down to .3 microns while maintaining airflow, allowing you to reach full capacity without clogging or caking. 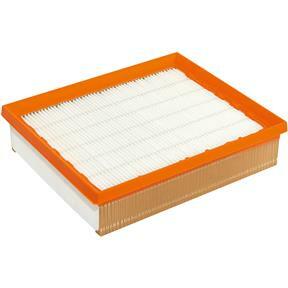 There is no better filtration on the market today. .